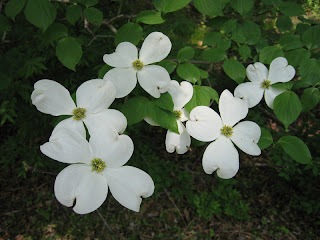 Flowering Dogwood (Cornus florida) -- I take the species name of this native tree, "florida", not to mean it's from Florida, but that it is florid, which is to say highly ornate. Florida has lost much of its floridity, but there are still lots of florid Dogwoods in the understory at Mountain Lakes Preserve, and their berries help sustain migrating birds in the fall. 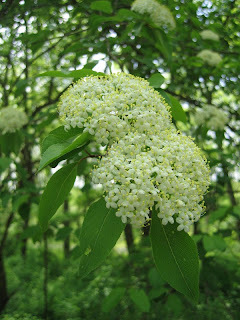 Blackhaw Viburnum (Viburnum prunifolium) -- This native shrub gets almost as big as flowering dogwoods, and has similar bark (see winter posting on bark). Their flowers advertise their locations in the woods this time of year. I've never seen pollinators visiting them, though somehow they end up with black berries later on. "Haw" refers to their similarity in form to hawthorns. 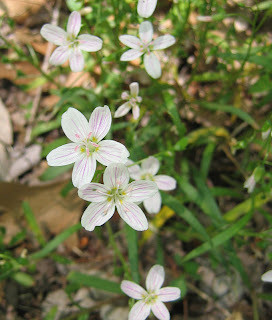 Spring Beauties (Claytonia virginica), another native, are still blooming from last month, to show solidarity with May's batch of white flowers. Sometimes they develop a radical streak and show a bit of pink. 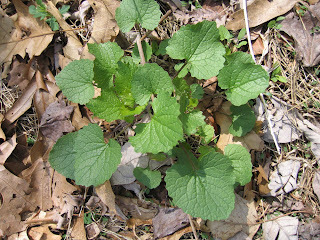 Garlic Mustard (Alliaria petiolata) -- See previous posting. An exotic weed of backyards and preserves. Try your best to develop a reflexive urge to pull this plant, since it conducts underground chemical warfare on native plant species, and is going to give your garden a distressed look when it turns brown a month from now. 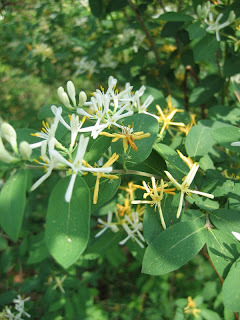 Bush Honeysuckle (Lonicera sp.) is another exotic that tends to invade nature preserves and pop up in backyards uninvited. Flowers are very fragrant. The annual canal cleanup along the towpath in Princeton on May 5 will include pulling invasive species along with picking up trash (more information on the cleanup below). 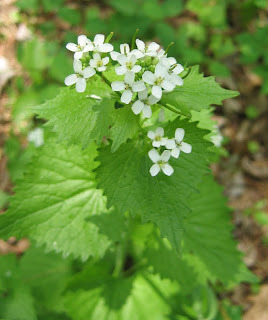 This is prime time for pulling up garlic mustard, an exotic biennial herb that has spread across the north and eastern U.S., displacing native species. Look most anywhere in Princeton this time of year and you're likely to see its dark green clumps rising from the ground. Its tendency to take over is abetted by its release of toxins through the roots that kill mychorrhizal fungi in the ground. Many plants, particularly trees, have symbiotic relationships with fungi, which help the plant absorb nutrients from the soil. Many species in the mustard family don't need these fungi, so gain a competitive advantage by killing them. 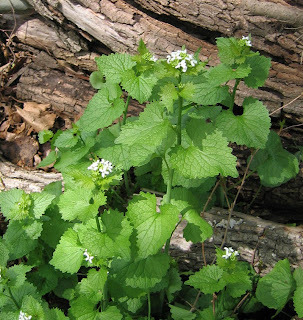 Garlic mustard grows as a low rosette the first year, then sends up a flowerstalk its second year before dying in mid-summer. Gardeners usually don't notice it until it blooms, and then think the bloom decent enough to leave it in. Only when the flowering stalk turns brown in mid-summer do people decide it's a nuisance, and by then the seedpods are ripe enough to burst when you pull it out. It's easiest to identify and pull when in flower, but because some viable seed may already be present in the flowers, stuff it into a trash bag and put it out with the garbage, rather than composting or leaving it to lie on the ground. Friends of Princeton Open Space and Princeton Water Watch are co-sponsoring a cleanup of the D&R canal in the Princeton area this Saturday May 5, 2007, 10 am - early afternoon Turning Basin Park, Alexander Rd at the canal near Princeton, NJ, rain or shine. We'll assemble at 10 am to coordinate our efforts, and then celebrate our results with a picnic from 1-2 pm, right after the cleanup. And at 1:30, Mercer Co. Wildlife Rehabilitation will bring some of their animals to teach us about the impact of pollution on wildlife. bags, disposable gloves, some grasping tools and some canoes and kayaks. clothing for adjusting to temperature.